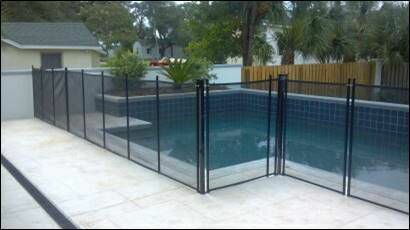 Pool Safety Fences add a definition to the pool and the transparency is unbelievable. Fence can intersect at different angles and gate placement is flexible. Fence enclosing whole deck so more room for toys, chairs and children. Large beautiful fence with 3 gates. Fence can be placed in between columns or inside the yard fence. Down one side of a negative edge pool and on a raised composite deck. Can follow almost any contour, self closing and locking gate set at corner. 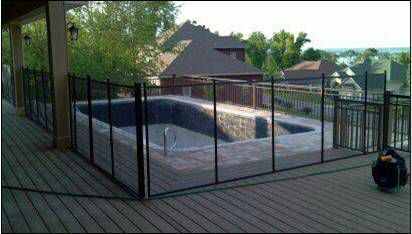 Pool Guard removable pool safety fence is tension designed pool safety system that can be installed in several hours to make your pool safe. It is removable by adults and typically takes about 15-20 minutes to take down or put up. The height of the fence is offered in 4’ or 5’ for keeping children safe. 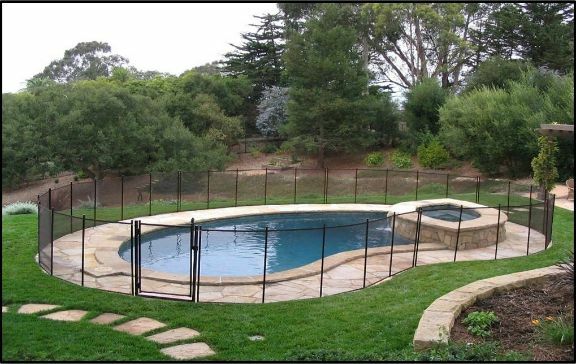 In the event that you have a pet that you want to keep out of the swimming pool, custom removable pool fence can be ordered to accommodate the height requested. Each section of fence is fifteen feet long and has a pole every thirty- six inches. The poles are made of 6063 marine grade aluminum with a powder coating to sustain the year-round climate in sunny Florida. Each pole is installed into a polypropylene deck sleeve that is one and one eighth- inch in diameter. 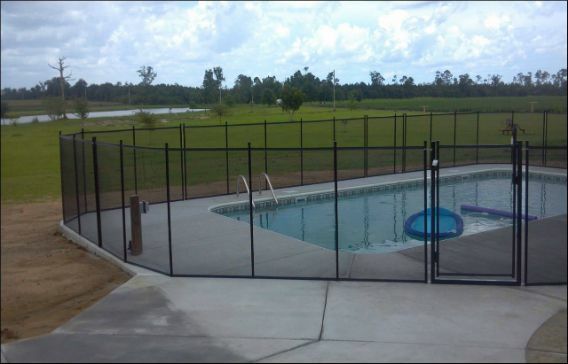 Each section of fence is held together with a 316 Stainless Steel hook and latch. The hook itself has a spring-loaded clip to secure the hook that has a hole for adding a small luggage lock should the homeowner want to attach locks to each section of pool fence. In the event the pool fence is removed for some reason, deck caps can be provided which can be inserted into the deck sleeve when the fence is not in use so that dirt, bugs and other miscellaneous things do not get into the sleeve. 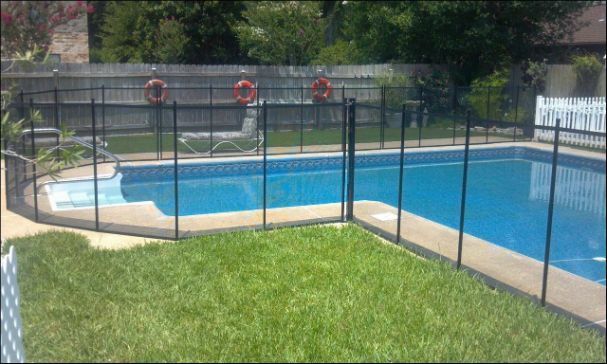 The border of Pool Guard fence is stitched on with a lock stitch using only marine grade thread. In addition to the double lock stich, the border has a UV coating as does the interlock and interwoven mesh of the fence allowing for durability and longevity of year-round usage. 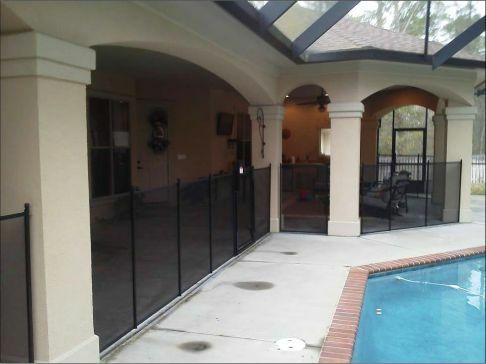 Pool Guard of the Gulf Coast recommends a self-closing, self-latching and lockable gate with every pool fence system. 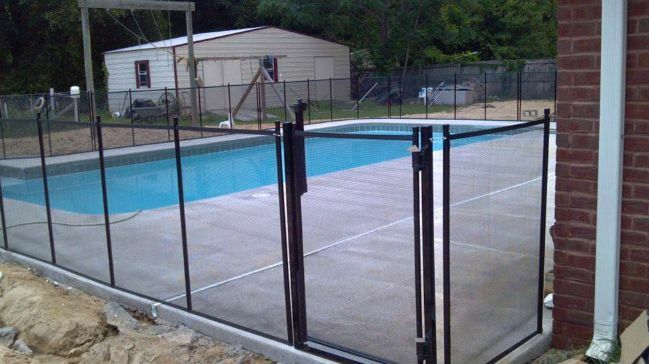 The sections of fence can be opened by an adult however sometimes they are not closed back (pool service personnel may accidentally leave the section open as well) resulting in an unsafe pool. 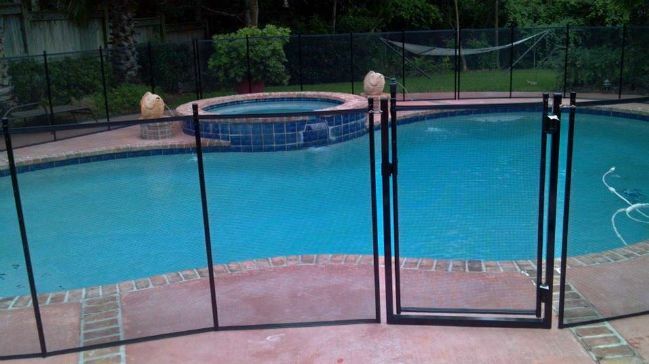 Pool Guard manufactured gates have a monolithic frame which has become the most reliable gate on the market. Each gate system comes with Tru-Close hinges and Magna Latch locking system. The hinges are adjustable and can be set to close faster (harder) or slower (softer) depending on what each respective client would like, the gate is adjusted accordingly. 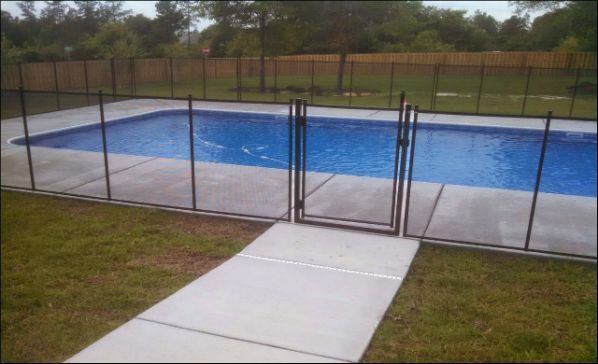 Each gate comes with two keys that are used to lock the gate when the pool is not in use. Each gate system has the lock and latch on the inside of the fence so that the gate opens outward versus inward. 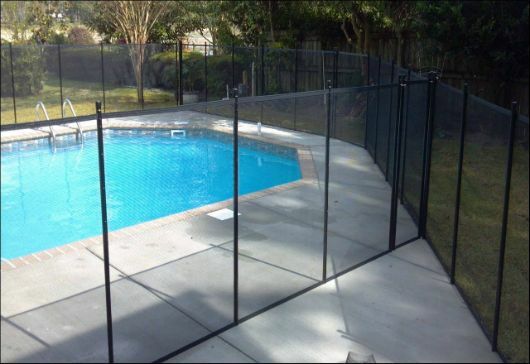 Our selection of pool safety fence colors come in wide array of colors. 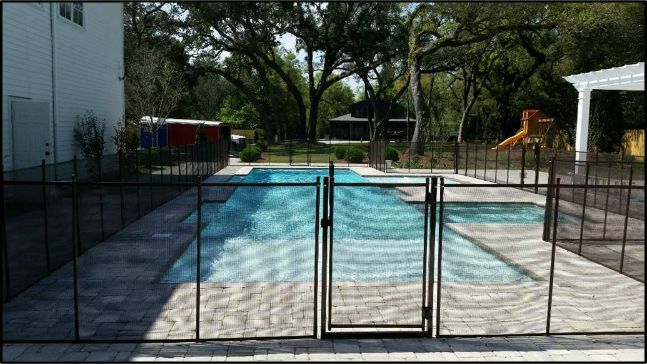 Our most popular are, black, brown and beige however we can offer a combination of these colors for border, mesh and pole colors should a specific look be needed for your pool safety fence. 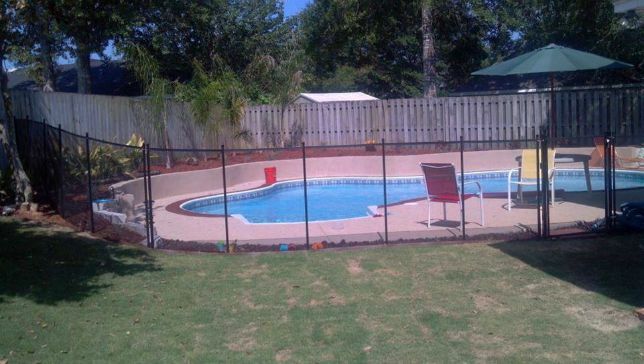 Cleaning your pool safety fence is as simple as using a broom and water. No need to use any kind so soap or detergent as these chemicals may break down the UV inhibitor on the border and the mesh. Water and a light brushing with a broom will take off anything that is on the pool fence. 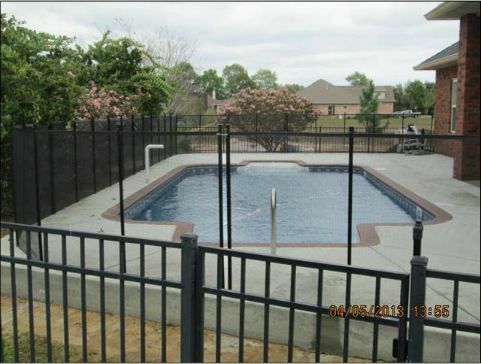 Pool Guard removable pool fence can be installed in almost any ground type. 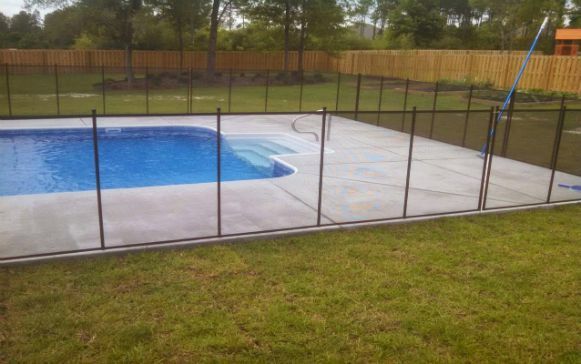 Pool Guard of the Gulf coast has experience with installing removable pool fence in concrete, pavers, sea walls and even in the grass. 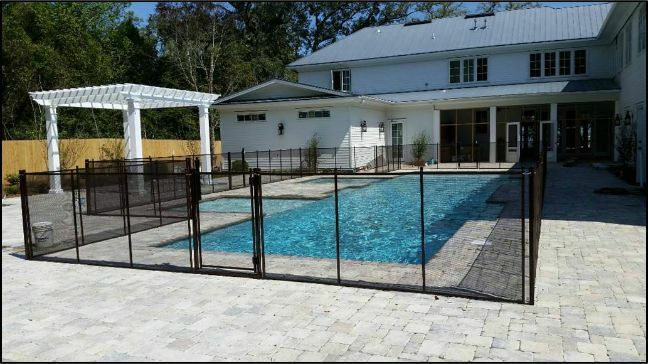 Pool Guard offers a limited lifetime warranty on the removable pool fence that you purchase with Pool Guard of the Gulf Coast. We will provide you with a written copy of the warranty for your records along with your receipt or purchase order.